Stainless steel case with a stainless steel bracelet. Uni-directional rotating bezel. Blue dial with silver-tone hands and index hour markers. Dial Type: Analog-digital. Luminescent hands and markers. Four- charge indicator, dual time, 24 hour, functions sub-dials. Quartz movement. Scratch resistant mineral crystal. Screw down crown. Case size: 47 mm. Case thickness: 15 mm. Round case shape. Band width: 23 mm. Fold over clasp with a safety release. Water resistant at 200 meters / 660 feet. Functions: hour, minute, second, chronograph, countdown timer, world timer, alarms, battery charge indicator, perpetual calendar. Sport watch style. 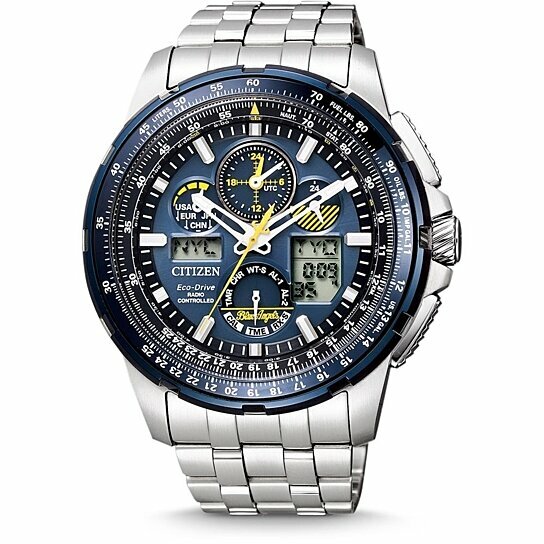 Citizen Skyhawk Blue Angels A-T Chronograph Perpetual Mens Watch JY8058-50L.